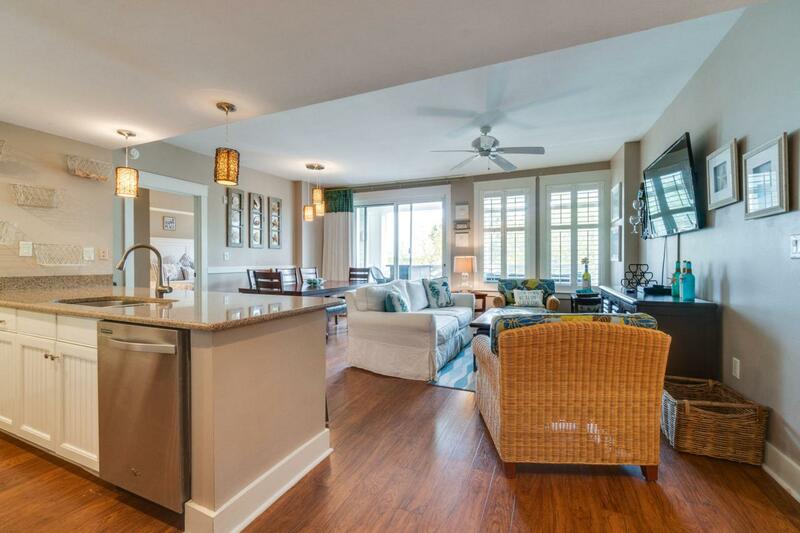 This renovated 5-star rated condo is perfect for family and friends centrally located within the Sandestin Golf & Beach Resort. Close to the Village of Baytowne Wharf, conference center, tennis, marina and much more. The condo has been lovingly cared for by the owners and has a strong rental history as a lock off. It can be used as a 3 bedroom, 2 bedroom and a studio. Located on the 4th floor of Pilot House with an open living space, beautiful kitchen, oversized balcony, master bedroom and spacious master bath retreat, relaxing furnishings and much more. The master bedroom is off the living area with attached master bath including large spa like shower. On the opposite side of the living area is 2nd bedroom and bath, . the 3rd bedroom/studio is attached with the bedroom offeringroom for 2 queen beds, kitchenette and full bath. Pilot House offers a delightful amenity terrace with pool, hot tub, children's pool, grilling area, fitness room and more. In addition, the Founder's Club is an area exclusive for owners overlooking the Baytowne Wharf stage. Sandestin Golf and Beach Resort features beautiful white sand beaches that the Emerald Coast is famous for, casual and fine dining options, tennis, golf, a marina, spas, shopping, daily live entertainment and much more!